The indicator displays on the chart the price zones between the round price levels. The distance between round levels is taken as 100%. from 31 to 69 (including level 50) - "Active zone", and the areas between them - "Neutral". To get the chart view, as in the screenshots, you need to set the white background of the chart in the terminal settings (F8 key). The indicator clearly shows where the price is at the moment, and also demonstrates the price movement between the neutral zones. 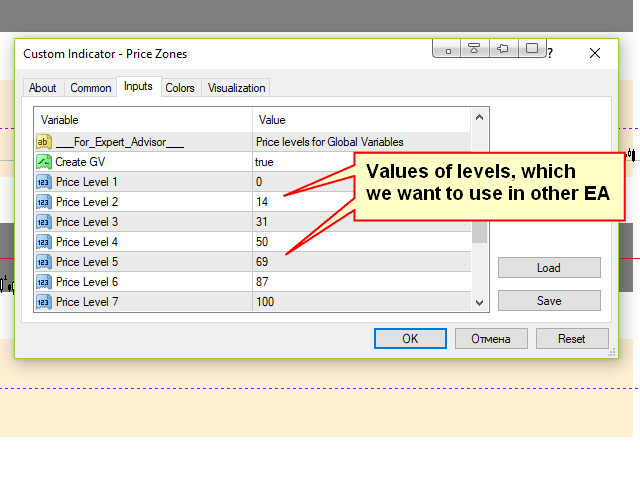 If necessary, the boundaries of the price areas can be changed in the indicator settings. 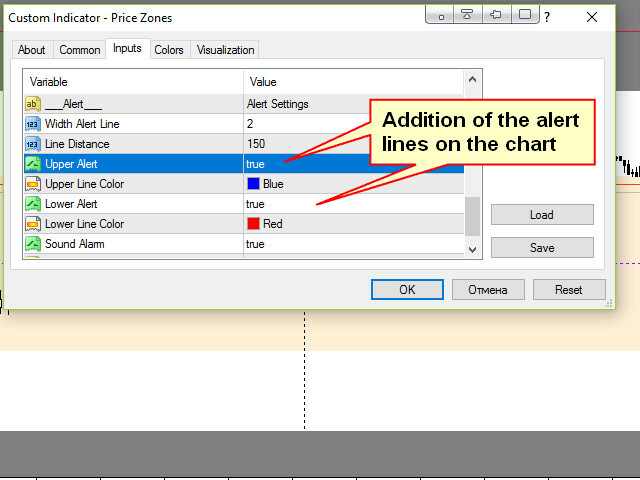 Here you can add to the chart signal lines, at the intersection by the price of which the indicator will issue an appropriate notification. The notification can be both in the form of a normal alert, or the playback of a user sound file. 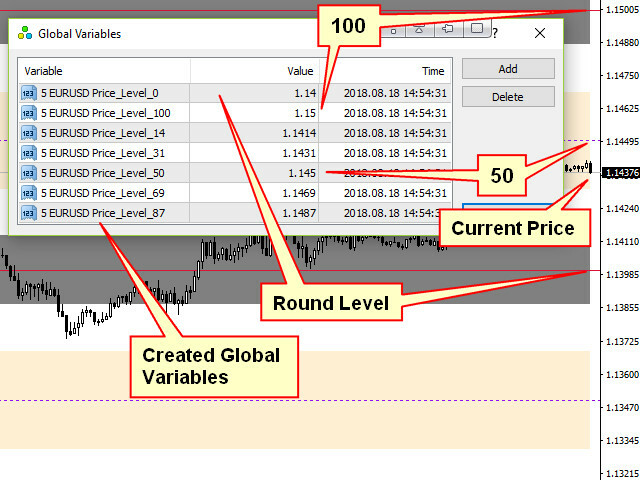 In addition, the indicator implements the function of automatically creating global variables (up to 7) that are familiar with the language mql4 can use to work in advisers. For this, in the settings you can independently set the required levels, the corresponding price values ​​which you want to use. Number All Zones - the required number of round levels (total down and up) from the current price position. Line Color 100 - the color of lines of round levels. Line Style 100 - style lines of round levels. Line Width 100 - width of lines of round levels. Line Color 50 - color of lines of levels 50. Line Style 50 - style lines of levels 50. Line Width 50 - width of lines of levels 50. AreaColor 31_69 - the color of the price range from level 31 to 69. LineColor 31_69 - the color of the lines that limit the price range from level 31 to 69. Value Line 31 - the lower limit of the price area near the levels 50. Value Line 69 - the upper limit of the price area near the levels of 50. AreaColor 87_14 - the color of the price area from level 87 to 14. LineColor 87_14 - the color of the lines that limit the price range from level 87 to 14. Value Line 87 - the lower limit of the price area near the round levels. 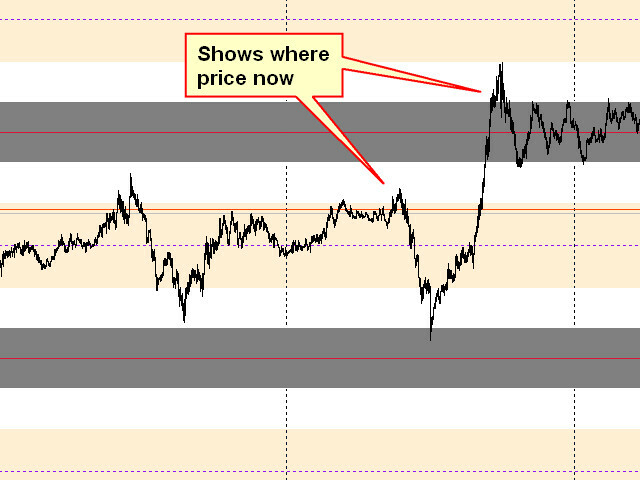 Value Line 14 - the upper limit of the price area near the round levels. Create GV - enable automatic creation of global variables. 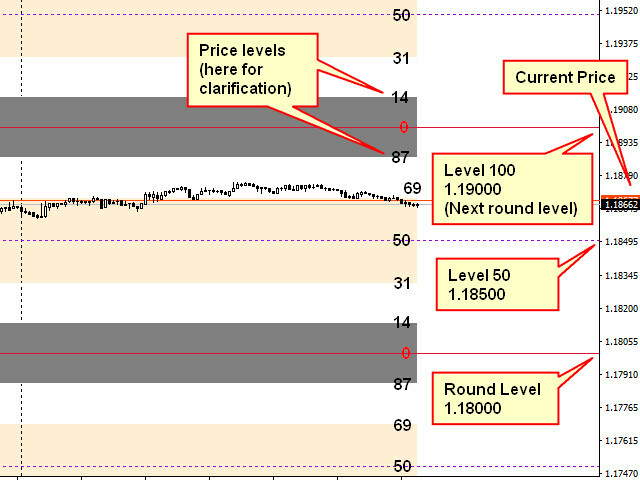 Price Level 1 (2,3,4,5,6,7) - set levels. Are intended for use in work of advisers of the values ​​of the price corresponding to these levels. Width Alert Line - the width of the signal lines. Line Distance - the distance from the current price at which the lines are created (in points). 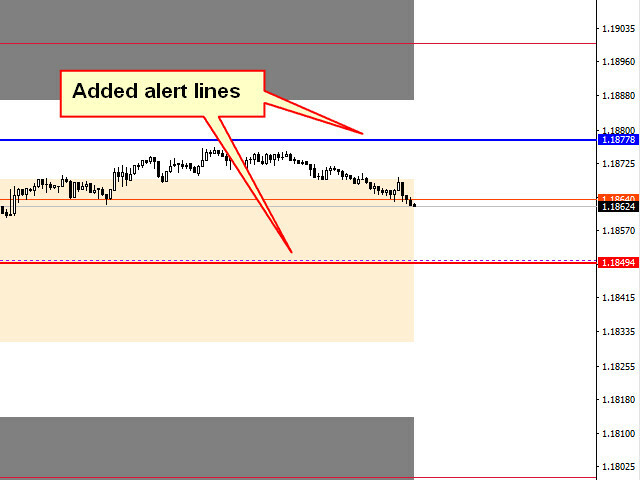 Upper Alert - add the upper signal line. Upper Line Color - the color of the upper signal line. Lower Alert - add a lower signal line. Lower Line Color - the color of the lower signal line. Sound Alarm - play the sound file when crossing the signal lines. File Name - the name of the sound file in the format "***. Wav". The file itself needs to be placed in the Sounds folder of the terminal. Note: To stop playback, you can install an additional Sound Stop script from the list of products in the terminal and apply it when the file is to be stopped. Optimized the function of tracking the price. Added a new logo indicator.